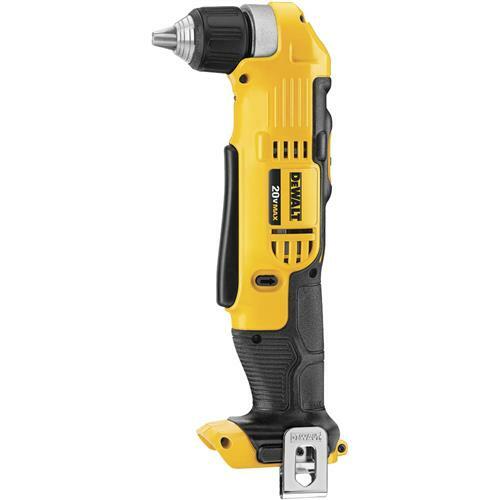 The DEWALT 20V MAX lithium ion 3/8-inch right angle drill/driver has dual speed ranges (0-500/0-2000 rpm) for increased user flexibility, providing a wide range of applications. 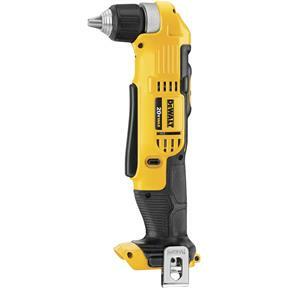 It has a very compact front to back length (only 4 inches) allowing users to fit it into hard to reach spaces that other drills cannot access. The multi-grip trigger provides comfort and convenience allowing the user to get into tighter spaces while still having access to the trigger. 3/8" Ratcheting Chuck with Deep Hex Pocket allows 2" (50mm) hex bit to be full inserted for getting into tight spaces. Kit includes: drill belt hook and 2 Phillips bit. Batteries not included. Dual speed ranges (0-650/0-2000) rpm for increased user flexibility providing a wide range of applications.